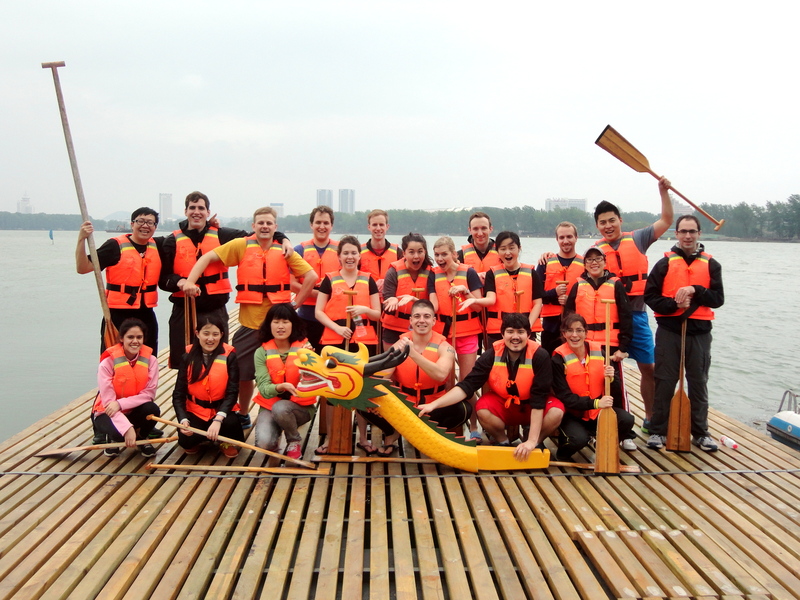 It is spring time in Nanjing, and that means HNC students are again gearing up for participation in the annual Dragon Boat race, to be held this year on May 31 at Mochou Lake. The Dragon Boat festival, or Duanwu Jie, got its start as a way of commemorating Qu Yuan, a patriotic poet, scholar, and advisor to the Emperor of Chu who lived over 2,000 years ago. Qu was exiled from the imperial court as a result of political intrigue and later, in despair upon hearing of the defeat of his beloved Chu, committed suicide by jumping into a river. The local people tried to help him by rowing boats out to the river’s center, where they tried to rescue him and,when that failed, threw rice dumplings, known as zongzi, into the river to prevent fish from eating his body. Today, people continue to commemorate his life by participating in boat races and eating bamboo-wrapped zongzi on the 5th day of the 5th month of the lunar calendar. Although it started in China, dragon boat racing can now be found all over the world, including in big US cities like Washington, DC. Dragon boating has a decade-long tradition at the HNC. Although the Sheraton Hotel, which has organized the annual competition for the past 13 years, traditionally places first, the HNC team has been doing increasingly well in recent years, coming in third overall in 2011. The 2011 HNC team has become something of a legend, not least because they were so dedicated that they began practicing during the fall semester and routinely woke up at 5 a.m. for chilly early-morning practices on the lake. The members of this year’s dragon boat team, led by Joe Plantamura, the HNC Certificate student who took the initiative to organize this year’s activity, have already proven their dedication, and perhaps their relative insanity, during their first on-the-water practice under a chilly downpour. By the end of the practice, everyone was soaked from a combination of rain and lake water. The second practice two weeks later was even more taxing, as the rain came with a stiff wind that stirred up the water and made it difficult to paddle. However, it will take more than inclement weather to deter this year’s dragon boaters. When they are not practicing on the water, they are setting up chairs in the HNC gym to simulate dragon boating and sit side by side, using oars made of thick dowel rods and cardboard to practice paddling in time to the steady beat of a drum. According to Plantamura, the most challenging aspects of dragon boating include mastering the correct technique of holding the oars and learning to paddle in sync. Since learning new things comes naturally to HNC students, he says he is confident the team will master the technical challenges of dragon boating in time to make a good showing in May’s race. Although participation in dragon boating is a long-standing tradition at the HNC, it has always been a student-organized activity. This means that while the school funds part of the registration fee, all other costs, including the cost of practices, must be covered by the team. The HNC team is in the process of planning several fundraising activities to cover such extra costs, including a t-shirt sale and a rock concert. If they go about their fundraising activities with anything resembling the gusto they put into paddling, they should be well on their way to covering the full cost of practices, with perhaps a little something left over for rain gear.